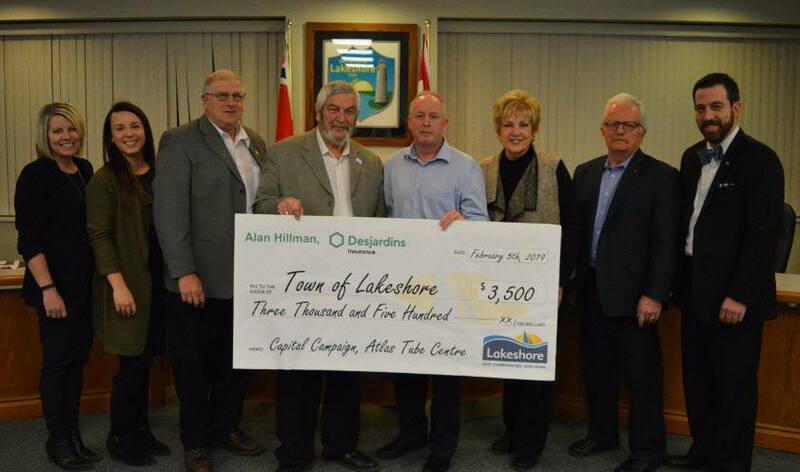 The Town of Lakeshore received a cheque recently for $3,500 from Desjardins Insurance for the Atlas Tube Centre’s capital campaign. “As a resident of Lakeshore, I have been involved with Belle River Minor Hockey for 15 years. When the opportunity arose with Desjardins Insurance to obtain funding, I immediately wanted to give to my community and celebrate the amazing facility we have with the Atlas Tube Centre,” stated Alan Hillman from Desjardins Insurance. “I am constantly reminded and impressed by the support Lakeshore receives from the community. Residents and visitors alike tell me how much they enjoy the Atlas Tube Centre.” states Lakeshore Mayor Tom Bain. We are very fortunate to have this facility and greatly appreciate the support Alan Hillman and Desjardins Insurance have given us.